This is Part 24 of a month-long series you can learn more about by starting with Day 1 here. There are many others doing super cool series this month as well, perhaps you'd like to see the list? Pretty much everyone will tell you that having a child changes your life. But that life change need not be only approached from the negative angle, Look at all that I'm losing. For Scripture attests to children being a blessing. From our children we can gain new insight into the depth of our own need for the cross. Believe it or not, this is a HUGE blessing - no matter how painful - and can take us from a look at the freedom lost to a look the freedom gained; praise the Lord perspective. When Elizabeth was small, I thought I was a pretty good parent, mostly because I had rules and Elizabeth needed to (and often did) obey them. Comparing myself with other more lax parents was my measuring stick. At least I was doing it "right." She was walking way too slow and I was carrying a bunch of heavy things. Could she not just hurry up so my arms wouldn't break? For. goodness. sake?! Um, no, she couldn't. She was one and a half, with short chubby little legs that had only been walking for a handful of months. Dear Lord, have mercy. I hate that memory, and others like it. I could have made two trips with all of the stuff in my arms and gently gotten E to where she needed to be, without the rage. But I was so very self-absorbed. Parenting a child will open up so many new doors for a parent to see new depths of his/her depravity, if one's eyes and heart are open to seeing. Early on in the series I spoke of death having everything to do with moving into the new life to which Jesus calls us. Admitting that I, as a parent, have a heart problem and it's not just my kids that "make me" do things, means that a little bit more of me has to die. But as the old sinful habits, reactions, and behaviors begin to change, we're ushered into a new era of parenting - no longer a constant battle of wills, but rather a training ground for both you and your child(ren) to trust the Lord for help with our actions and reactions. God brings freedom from the tyranny of getting it all right, with our kids' obedience indicating "how we're doing" as parents, and gives us freedom to entrust their little souls to Him, as much as we've entrusted Him with our own. As a parent you've been called to raise up your little (or big) ones. When God calls, He provides all we need to pursue the calling. But he never promises it will be easy. Think about the call on our Savior's life, that cost Him his life! Most of us will not taste physical death as a result of rearing our children, but we may need to put big prideful chunks of ourselves to death to move forward in faith in this calling, becoming more of the parent God wants us to be. Parents, God bless you as your love, nurture, disciple, discipline, and train your children. It really is an endless job, but you are not alone and God has good things in store for you and your kids. Trust Him in and with it all! Next Monday our 31-Day journey comes to an end. One more week. Phew, this has been a delightful and intense adventure in writing! To celebrate, I'm going to give away a couple of books next Monday, October 31! 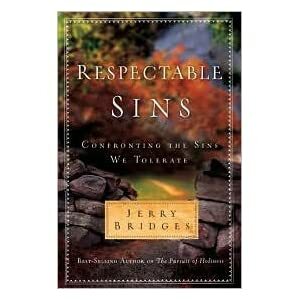 Jerry Bridges is an author who has profoundly influenced my faith, so I'd like to pass along two of his gems. To enter the contest, please leave a comment here, letting me know whether you'd like your name entered for just one or both of the books. If you have been with me throughout the whole month, I'll give you a bonus entry - be honest! And if you post about the giveaway on your own blog or Facebook, I will enter your name yet again. Wow, so many ways to increase your chances of winning; things are getting crazy around here! Entries will be received until 7:00 am on Monday, October 31. I'll announce the winners in the final post of the month! *I wrote a 3-part series last year on What Should We Expect From Our Children. Click to read: Part I, Part II, Part III. The final post has a list of some of my favorite parenting/motherhood reads, if you'd like to go more in depth on this topic. I can definitely identify with this. I have to admit though, God has been teaching me so much about myself as I parent Caleb and Sadie. They each have their own challenges. We talk a lot with Caleb about our feelings and I find that I use the same language to explain to Sadie when I'm "frustrated" by her behaviors. I don't know how much it helps but I'd like to think that she can understand a little more that I'm not angry at her, that I still love her dearly, even when Mommy yells. I know we're not going to be perfect parents but we're going to do our best and being a parent has taught me so much about grace. I know my parents made mistakes but instead of feeling bitter about the mistakes I'm reminded that they were doing the best they could. Please count me in for the drawing for both books. I'm about to post on FB for the drawing as well. Andrea, welcome to the blog!